We are sure that on more than one occasion you have wondered what hardware are those which ensure you better benefits. Today you will learn the benefits of aluminum and glass blinds.Aluminum and glass blinds are a hardware which provides attractive value added to the global assembly of a kitchen cabinet. That is why it is essential to have a hardware warranty that provides aesthetic and, furthermore, guarantee of strength, durability and stability. This hardware also seeks to have an excellent sliding unobstructed. Currently this hardware is being specially manufactured by German and Italian companies which have known how to bring a remarkable value to furniture. These companies have incorporated aluminum slats of different widths, other finishes of quality, glass which replaces the aluminum, as well as very beguiling novelties for the customer: LED lights, electrical systems via remote control, and much more. Now, finally, Chinese manufacturers are reproducing more successfully these systems, achieving a final product which has almost identical features to those offered in Germany or Italy, but logically at a significantly lower cost. This decorative hardware for the kitchen cabinet, so far, is only placed in medium or high range kitchen furniture, but from now, thanks to the excellent prices we can get in China, we have contributed significantly for this type of hardware to be much more popular, thanks to its new low cost, standard range kitchens will also be able to have high quality blinds. At IBMH we have visited the factories that have managed to reproduce the blinds with a quality really incredible. 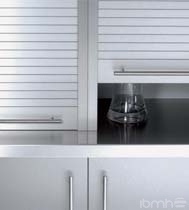 These suppliers manufacture wide 20mm and 25mm aluminum slats and on special demand, wide 50mm aluminum slats, including glass slats in different finishes. Thus, we can confirm that we have roller blinds with a genuine guarantee and a direct manufacturer and really specialized. What do you expect to buy roller blinds of high quality from China?